Trees and graffiti growing inside an abandoned concrete building near Vernonia, Oregon. I camped at a town park just outside of Vernonia. This building stored sawdust fuel for a big mill that is no longer there. There is a small lake that was the mill pond. Campground is across lake from this building. 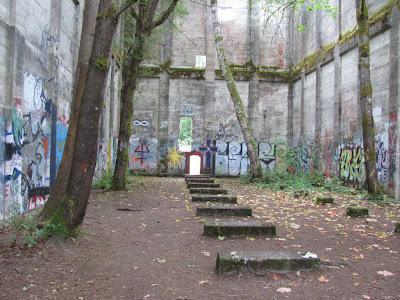 Looks almost like a cathedral inside old Vernonia fuel house. More images from there. At the campground, some other campers caught crawdads in the Nehalem River for cooking. They look kind of creepy with their claws, but taste like lobster. I tried some and they were good. First time I have eaten crawdads. Ferry from Cathlamet, WA to the Oregon side of Columbia River is quite small. Maybe only 8 cars and my bike. Even makes Lummi Island ferry look big, if that's believable. Weather has been great. Overcast and delightfully cool in mornings, but no rain. Sunny and partly cloudy in afternoons. In Forest Grove, I'm visiting a friend named Kody who used to live in Bellingham. He volunteered at the Radio Museum in Bellingham and is now attending an art college in Portland. Old railway wigwag signal can be activated by pushing a button at Banks Trail Head of Vernonia Banks Trail.